Eduardo Fernández, the owner of Aganorsa S.A., surveys a field of sun-grown, Cuban-seed tobacco in one of the company’s many vegas in Nicaragua. Nothing particularly unusual was going on in the acres of farmland that lay behind a locked gate in Jalapa, Nicaragua. The shade-covered fields that were once owned by dictator Anastasio Somoza were growing tobacco just as they had decades before. Nevertheless, in 2000, in the post-cigar-boom world, the operation was a source of some suspicion in the industry. For one thing, its owner was new to the cigar world and his workers were all from Cuba. Furthermore, no one in the cigar busines had any idea who was buying all the leaf. The rumor around the industry? That the tobacco was being produced for Cuba’s cigar factories, to be used in place of Cuban tobacco to wrap some of Cuba’s best cigars. Now there is no mystery about who buys his product, as Aganorsa has been transformed from an unknown organization into a major force in the world of Nicaraguan tobacco that has built a clientele by growing tobacco in the old-fashioned Cuban style, using Cuban seeds and the oversight of well-seasoned agronomists from Cuba. Aganorsa plants some 1,200 acres annually in Nicaragua yielding some 15,000 bales of wrapper, binder and filler tobacco, all of it grown from Cuban seed, enough to make tens of millions of cigars. Aganorsa claims to be the biggest grower in Nicaragua—Plasencia Tobacco disputes this, saying it is the larger grower—but there is no denying that Aganorsa grows immense amounts of cigar tobacco that is being used inside and around some of the world’s best cigars. Giant and boutique companies alike get tobacco from Aganorsa. The Illusione Epernay Le Taureau, Cigar Aficionado’s No. 3 Cigar of the Year, is made with Aganorsa tobacco, as are several others on the list. Altadis U.S.A. Inc., which is one of the world’s largest producers of premium cigars, is a major client. Aganorsa also counts Padrón Cigars Inc.—a company that has scored higher in Cigar Aficionado taste tests than any other—as a customer. Aganorsa has its own cigar brands—Casa Fernandez—which unsurprisingly uses Aganorsa leaf. Most of its cigars are made in Honduras by Fabrica de Tabacos Raices Cubanas, which uses vast amounts of Aganorsa tobacco. Fernández also owns a small cigar factory in the United States. Born in Havana, Fernández moved to the United States as a young boy. After graduating from Wharton School of Business, he began a career in banking in New York City. He spent 10 years in Manhattan, then moved to Madrid and joined his brother Leopoldo to open Telepizza, a restaurant chain combining Spain’s tapas with New York pizza, delivered on Vespas. The business proved very successful, with sales exceeding $275 million, and the brothers took the company public. Fernández then had quite a sum of money, and yearned to escape Madrid and get away from corporate life. “Being an island person, being in Madrid, four hours from the ocean, I felt a choking effect,” he says. He yearned to work the land. Unable to farm in his native Cuba, he looked to Central America. “I always had this great image of Costa Rica, but I was won over by Nicaragua,” he says. Fernández saw a bargain opportunity in the post-cigar-boom environment of Nicaragua. A tobacco cooperative called TAINSA was struggling as cigar sales tapered off. In the summer of 1997, Fernández created Agricola Ganadera Norteña S.A.—known as Aganorsa. He dipped a toe in the waters, making a first purchase of 100 manzanas, or about 168 acres in the Spanish measurement system common to farms in Nicaragua. Most of the acreage was in Jalapa, in the north of Nicaragua, which is a region known for the country’s most beautiful wrappers. He also owned a smaller amount of land in Condega, a region located farther south, closer to Estelí, with a reputation for growing tobacco that strikes a balance between elegance and power. But despite having great land and Cuban technicians to handle the planting, Aganorsa’s start was a troubled one. The cigar business is built on trust and reputation, and it’s hard for a newcomer to break in, especially during difficult times. 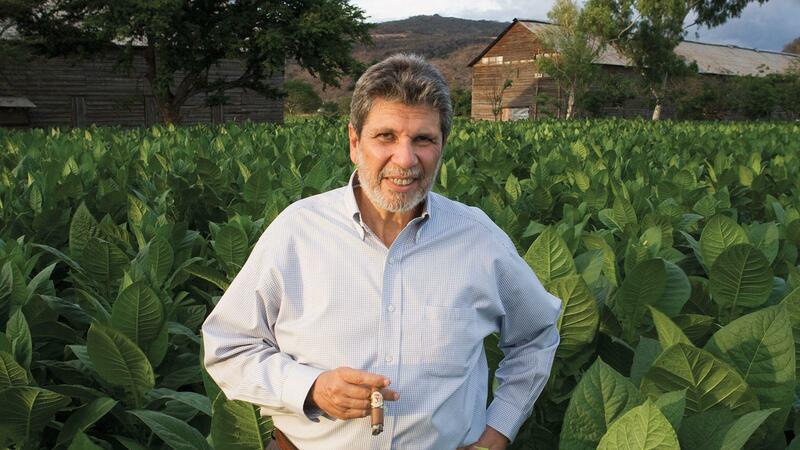 “People would not buy tobacco from us,” remembers Fernández. Flustered, he turned back to Europe, and began selling tobacco to long-leaf brokers in Spain. And that’s where he met Arsenio Ramos. Ramos is Fernández’s tobacco MVP, a 76-year-old from Cuba with big glasses and a cigar perpetually stuck in his lips. (Casa Fernandez has a fine cigar bearing his name, the Casa Fernandez Arsenio, which rated 89 points in this magazine.) Ramos is a walking encyclopedia of tobacco who was ready to retire from Cuba’s cigar industry, where he was in charge of fermentation operations. “He was the best in Cuba in terms of fermentation,” says Fernández. In Jalapa, Ramos shows off some of his skills, pausing to describe the dirt in this gorgeous part of the world, which is a long, bumpy drive from the cigar capital of Estelí. “See this soil?” says Ramos. “It’s the same as San Luís, in the Vuelta Abajo. This is just like the El Corojo farm.” He stoops down, grabbing a fistful of brown earth in his calloused hand. Spending an afternoon with Ramos is a constant lesson in the art of growing fine tobacco, not to mention a nonstop smoke session. “Tobacco has 27 minerals,” Ramos says at one point to explain how proper fermentation is essential to rid the leaf of unwanted properties. “The hardest to take away are the proteins and the acids.” Protein is a particular problem, he says, as it turns to ammonia, the bane of tobacco. Ramos is a weathered man with a generous belly and a frown that quickly turns into a broad smile when his sense of humor kicks in. He is smoking various puros made entirely with one type of tobacco to get the true taste of that single component. When Ramos decides cigar “A” is a good match for cigar “B,” he jams both in his mouth at the same time to prove his point. This maneuver elicits guffaws from his coworkers. Joining Ramos and Fernández is Jacinto Iglesias, another Cuban tobacco technician who looks entirely different from Ramos. He is almost impossibly lean, with a mustache thicker than a push broom flecked with white hairs. “Jacinto came in as an expert in sanitation and fumigation,” says Fernández. The two are Fernández’s go-to agronomists. He later worked together with José “Pepin” Garcia to open cigar factories in Miami and Nicaragua. The partnership ended poorly. After a lawsuit that began in 2010 was settled last year, the two companies have now gone their separate ways. Fernández now has a new Miami factory, owned entirely by him, and it’s already making some stunning cigars. The factory’s Casa Fernandez Miami Toro, an $8 smoke, scored 92 points to earn the No. 12 spot on Cigar Aficionado’s most recent Top 25 tasting. It was the only American-made cigar on the list. The cigars at the factory are made in the Cuban way: “Triple capped, Grade-A, Aganorsa leaf,” says Paul Palmer-Fernández, Fernández’s cigar-loving cousin. Fernández brought Palmer on board to run his cigarmaking operations after he acquired Tropical, and today Palmer is president of Casa Fernandez/Tabacalera Tropical. Fernández can now speak for hours about the properties of tobacco and what makes one type different from another. Most of the tobacco here is grown under shade. It’s tall and elegant, rising from the reddish soil that’s reminiscent of the fields in the Vuelta Abajo. The curing barns that store it after the harvest are tall and long, beautiful structures that have stood strong against scores of hurricanes and lesser rainstorms that have battered their wooden exoskeletons for 50 years. Near the end of the long day, the Aganorsa team of Fernández, Palmer, Ramos and Iglesias stand in the gloom of a dreary tobacco warehouse. Palmer has dubbed this area the Skunk Works, for here is where they come up with blends, mixing a bit of this and a bit of that. Palmer has a worker mix up a blend on the spot, with some Corojo ’99 ligero from Jalapa, seco from Jalapa grown from Criollo ’98 seed, and some medio tiempo harvested in Estelí.